Is having your carbs at night the nutritional answer to your fat loss questions? Let’s clear it up now. There are so dang many myths about fat loss it’s horrifying. The vast majority of these myths are about carbohydrates and calories. Many of us are so desperate for the “answers” to our fat loss problems that we’ll try anything any everything to take the weight off. Unfortunately, that means we waste a whole lot of time and energy on strategies that just don’t work and/or aren’t remotely healthy. Don’t believe me? Ask yourself why so many people are *always* on a diet yet can’t sustain lasting weight loss. No, seriously! Is what you’re doing working for you? If you’d rather hear me explain this and watch a video training, click here! Otherwise, just keep on reading below. Some people are better are learning by hearing, so I wanted to offer that option before we contine. One of the most common fat loss myths is that you should eat your carbs in the morning so you have all day to burn them off. It’s not true. That myth does not reflect how your body works and in this post my goal is to explain why you should eat your carbs at night when fat loss is your goal. Before I dive into the explanation, let me see if this sounds familiar to anyone out there: Have you ever had a bowl of cereal for breakfast and felt hungry less than hour later? Or chowed down on a big bagel but it didn’t hold you over for long? When fat loss is the goal and we start the day with carbohydrates (granola and fruit, bagel, cereal, pancakes, etc) we set ourselves up to prevent fat burning and trigger extreme hunger, constant cravings and low energy. This is true because of the unique hormonal environment in the body after an overnight fast and upon waking. After an overnight fast, your blood sugar and insulin levels will be low when you wake up. This makes the morning the time of day when we will have the most exaggerated response to consuming carbohydrates. Imagine you were in a totally dark room for 12+ hours and then someone comes in and turns on a flood light. Your eyes would have an extreme response, right? Now imagine you’ve been outside in the sun all day and someone comes out and turns on a flood light. Very minor response, if any, right? Introducing carbs in the morning is like turning on the flood light after being in the dark room for hours and hours. Your body has been fasting while you sleep. Your fuel is low. You will have an exaggerated blood sugar and insulin response in the morning. Why does that impair fat burning? Because you cannot burn fat when insulin is high. Insulin is a storage hormone. A fuel delivery hormone. The presence of insulin tells the body, “Hey! We’ve got fuel! We’re in storage mode now!” and that message prevents the breakdown of body fat for energy. Your body doesn’t need to burn the extra fuel when your blood sugar and insulin are elevated. There is no need for the fuel created by the burning of fat therefore your ever-efficient body will not allow fat burning under those circumstances. The exaggerated morning response means a larger surge of blood sugar and therefore a more significant insulin response. The result: more time out of fat burning mode compared with introducing carbs later in the day. On the flip side, when we don’t send our blood sugar soaring in the morning, we don’t require a large insulin deployment and we can remain in prime fat burning mode! Introducing starch or sugar in the morning puts us in what I call the carbohydrate cycle (I’ve written in more detail about it here). This happens with higher carb meals like pancakes, cereal, granola & fruit, etc. Sensing low blood sugar, your brain triggers hunger and cravings for carbohydrates even if your body doesn’t truly need more fuel. If this is true, wouldn’t it be best to never eat carbohydrates so insulin is always low? No, not necessarily. Hang tight, I’ll explain. How come I know lots of lean people who eat oatmeal or pancakes for breakfast? I did an entire episode on carbohydrate tolerance where I answer that question and talk about how you can IMPROVE your carbohydrate tolerance. But remember – there is a major difference between eating for fat loss and eating to maintain lean mass. Super different hormonal requirements. So listen to this episode. Now let’s address #1. Remember the example of turning on the flood light after being outside all day? Very mild reaction, right? That is pretty similar to your response to carbohydrates later in the day after your body has been responding to fat, protein and veggies in your meals and snacks. As the day goes on, as we eat throughout the morning and afternoon, as our hormones shift with the normal daily cycles and we become less sensitive to those spikes in blood sugar and insulin. But wait! There’s more! There is another morning hormonal situation that creates a really strong argument for skipping the starch and sugar at breakfast. Cortisol levels are at their peak in the morning. Cortisol, a stress hormone, rises throughout the night and reaches it’s peak in the morning. This is part of your body’s natural sleep/wake cycle. The rise of cortisol overnight helps you naturally wake up in the morning. The mere presence of elevated cortisol in the morning can help facilitate fat loss. However, if you elevate your insulin levels, game over. Cortisol compounds the fat-storing effects of insulin. Not only that, in combination, they can actually trigger the generation of brand new fat cells. No thanks! I’ll pass on the starch & sugar in the AM! However, cortisol levels drop throughout the day. They are lowest in the evening. Again, this is part of your body’s natural sleep/wake cycle. Lower cortisol in the evening helps you to fall asleep and stay asleep until it is time to wake up. By limiting your starch & sugar consumption to the evening, you’ll avoid these less-than-desirable effects of a high-insulin + high-cortisol environment. I’m so glad you asked! The most popular episode of the Primal Potential podcast is actually the episode where I talk about breakfast options for fat loss and give tons of recipes and meal ideas. You can check it out here. And I’m sure you’re wondering: “So when should I eat carbohydrates and which ones are best?” That’s where the Golden Rules of carbs & fat loss come into play and you can read about those here. The short answer is this: When fat loss is the goal, keep your carbs clean and limit them to dinner time or post-workout, whatever feels best for your body. There is no doubt at all that there is a ton of misinformation about carbs and fat loss and so many people get confused. But when you understand that fat loss is primarily a hormone game, it gets easier. Your hormones determine when fat loss is allowed and when it is not. Understanding these hormonal principles and the food choices that create the right hormonal environment is the key to removing all your weight loss struggles, frustrations and plateaus. Sometimes it is easier to hear someone explain these concepts than it is to read about them. I’ve done a handful of podcasts on these topics which you can check out below. Still got questions? I’ve got answers! Hit me up! If this was helpful, definitely check out this totally free resource on optimizing your hormones for fat loss. For more podcasts on these topics, check out the episodes of the Primal Potential podcast below and be sure to subscribe on iTunes, Stitcher, Spotify or iHeartRadio so you never miss an episode! WOW – this is BY FAR the best article I’ve read on the subject. Thank you for detailing this so clearly. I’ve heard the argument before but never understood the science behind it until now. Thank you for this. Just discovered your podcast which led me to your blog and I can’t wait to get through all the articles. I am not an RD. I do, however, have a degree in human nutrition. The difference between someone with a B.S in nutrition and someone who is an RD is an unpaid internship post graduate. I did not do the unpaid internship bc I did not desire to be an RD. Vegetables are carbohydrates. When you follow the Golden Rules of Carbs and Fat Loss, you are liberally eating veggies throughout the day. I am talking about limiting starchy carbs until night. So, while I respect your comment, there is way more than adequate glucose to fuel the brain. For what it’s worth, your brain can generate glucose with or without carb consumption. But, that’s not the point as I’m not restricting carbs but rather suggesting a more optimal time for STARCHY carbs. My wish for you is that everyone can respond to you with open-mindedness and respect. It’s cool to disagree, but let’s always try to be open and respectful. All the best! No you don’t. You do not even mention starchy carbs in the article. I read that on keto diet, if you eat too much protein, your body converts excess to glucose. Thanks for reaching out! So, that’s not related to the keto diet, but simply protein in general. It doesn’t matter if you’re eating fat, carbs, protein or a mix, there is no storage form for dietary protein. Excess will be broken down and converted appropriately for storage. Glucose is one of the elements along the way to storing excess protein. We have storage forms for dietary carb excess and dietary fat excess, but not dietary protein excess. So, this isn’t about being on the keto diet, it’s just true of protein, period. I found this article one of the most interesting..we are told NOT to eat carbs at night, limit them to the max, eat all carbs by 6 pm..I’m generally healthy, of normal weight, works out on a regular basis(2-3 times/week), but would like to lose about 5-6 pounds esp in my belly, which I have gained over the past 1-2 years. I consciously limit or avoid carbs at night. This is not easy since mealtime with the family happens at night… I end up picking on proteins only..! I must also add eating all these cabs during the daytime make me sluggish esp after lunch when i eat my biggest meal, always rice or pasta or bread related. Lately it seems almost impossible to stay awake and alert after lunch! I’m open to this idea of eating carbs at night, of course using common sense and not piling up all the carbs under the sun !! Pls advise best foods which optimizes performance during the day. I’m an entrepreneur who needs to keep my mind sharp and energy levels high. Tks. Your body will give you the answers. I go into lots of detail on the podcast about carbs and energy and carbs and fat loss – I’m very straight forward in my opinion as well as the biochemistry behind it. But honestly, everyone should be listening to feedback from THEIR bodies. If you are having a hard time staying away after lunch, your body is telling you that something needs to change. In episode 063 I also talk about stubborn belly fat. You might find that episode helpful, too. All I can say is that, I have tried to eat my carb by 12 p.m. A small salad with a small piece of meat or fish by 5p.m and i lost 4lbs. in 5 days. I will always keep eating that way. It gives me lots of energy, no craving, no feeling of bloating. Awesome, Shade! As I always say, do what works for you!! If what you’re doing is working and makes you feel amazing, that’s all that matters! This was the most convincing argument I’ve ever heard. I too have heard about the advice to avoid carbs in the morning, but this really hit it home for me. It reminds me of the body’s exaggerated response to alcohol on an empty stomach. If i do my workout in the morning, what should be my post workout meal? should i eat carbs or stick to eating carbs at night. Thank you for your time. Unless you’re a super competitive athlete, most of us simply don’t require a special post workout meal. I talk about this in detail in my carb strategies for fat loss course, but basically, eat as you normally would, following the golden rules of carbs & fat loss. Let your body be your guide here. Your body will let you know what it responds best to after a workout. In short, yes, stick to carbs at night regardless of if you’re working out in the am. This is ideal for fat loss. Hello , im trying to build strong lean muscle mass. Should i still skip carbs in the morning or how should I approach carbs? What if i work out in the morning? Dont i need the carbs to fuel my workout? I want to bulk and build muscle without the extra fat. Im 17 and i want to bodybuild. Hi Jose! Great question! Regarding: do I need extra carbs to fuel my workout? No. Your body can efficiently use fat as fuel. In addition, fruits and vegetables are carbohydrates as well. That DOESN’T mean that you shouldn’t have carbs before a workout. If your goal is to build muscle, that don’t sweat carbs at night. Your goal is to put on weight (muscle) and this post was written “for fat loss”. The hormonal conditions required for an anabolic state (muscle building) are very different from those required for a catabolic state (fat loss). Hi Elizabeth! Adding to Jose’s question with your answer, do you have a separate article that talks about hormonal conditions for an anabolic state? Carb timing for muscle building? Thanks! Hey Elizabeth what is more effective for shedding body fat. The method you proposed in this article or the carb cycling method? The answer depends on the individual’s carb tolerance. There are so many factors here. Everyone’s individual body will give them the answer. There is no black or white “this is more effective” – it is about finding what is most effective for your body. I work primarily with women who have yo-yo dieted. Because of that, they are more insulin resistant and carb cycling = hunger and craving cycling. No bueno. 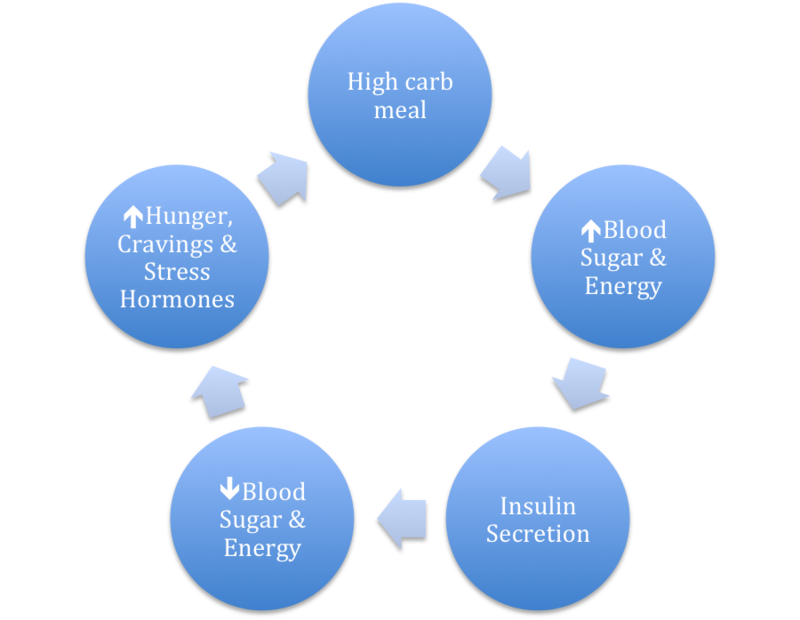 For someone who is very insulin sensitive and has a lot of glucose transporters in their muscle tissue, they might respond very well to carb cycling. Bottom line: I don’t think ANY question like that can be answered categorically. It is based on the individual. For most of the people I work with, consistently following the Golden Rules of Carbs & Fat Loss is most effective but everyone needs to listen closely to their own body. This was excellent. I was reviewing my nutrition strategies and your insight has been very useful. Im 94lbs down. I see a rough outline of my abs… a few more weeks to go! What about folks with adrenal fatigue? Adrenal fatigue is characterized by cortisol levels that are too high at night and not high enough in the morning. Wouldn’t that mean some of us should eat our carbs in the morning rather than at night for the effect you describe? Nope, not necessarily, because remember that veggies are carbohydrates and we want to consume them liberally throughout the day. I recently did an episode on adrenal fatigue, in case you haven’t seen that one yet, but the thing is this: there are much “bigger rocks” when it comes to adrenal fatigue. I’d still really encourage skipping the AM carbs for folks with adrenal fatigue, but might have them up the veggies throughout the day. I’d encourage them really hone in on the big rocks like sleep, meditation, caffeine, stress and avoiding strenuous exercise. Having a piece of fruit in the AM or avoiding the piece of fruit in the PM isn’t likely to move the needle. This is very interesting, I have found that about half an hour to an hour after eating carbs I get fatigue and have to eat something high in sugar to get energy again. Don’t know why but it doesn’t seem to happen so much after eating protein and fat so could this be adrenal fatigue? Just you mentioned you knew about adrenal fatigue so just thought I’d ask. I think it’s more likely related to blood sugar fluctuations. Very common with eating carbs. Don’t see the same blood sugar fluctuation with protein or fat. Hello Elizabeth. Today I found you on spotify and god how much I am happy to find you. You’re thought,ideas and the science behind resonate with my way of thinking. I really feel like the only answer to these kinds of questions is to try the strategy and pay close attention to whether or not it works for you. There is no “yes”, “no” answer here. There’s only what works best for you. That means: what delivers results for you, what makes you feel amazing and what is sustainable for you. I don’t do well yo-yo’ing between approaches. I do best with a steady, consistent approach of real foods based on what I love and feel like eating. That’s not the approach for everyone and what matters is not what you find in research but what your body tells you works or doesn’t for YOU. Love your advice! I just started a low carb diet as in past it worked well. Last nite I was awake until 3 AM! Then was also so hungary had some crackers and cheese and fell asleep! So I think your carb at nite advice must be the trick. No sleep is disastrous for health! I want to know if coffee & cream first thing is ok in AM? Then protein? Thank you! Fat, protein & veggies are wonderful in AM. Limit those carbs in the AM when the goal is fat loss. I’m interested in giving this a try but I need an idea of how to split up my daily carb intake AM vs PM. Would you recommend something like 20% AM / 80% PM? Or should you avoid carbs in general in the AM and just consume them in the afternoon/evening/night. Thanks! This depends on YOUR personal baseline. Any reduction in the AM is going to help and your body will respond to what represents an improvement for YOU. I personally avoid carbs in the AM in general and my clients have the best success when doing so. Great article, you had me identifies in the first paragraph or two. Are there certain carbs you should stay away from even at night? Hi thanks for the post! I am a vegetarian currently in weight loss mode and I have a few follow up questions on the article! I would like to try to limit my carbs to dinner. I try to workout in the mornings and typically like to eat an apple before I workout. Would that diminish my potential weight loss returns? What about a protein shake after the workout? Would that run contrary to what you are suggesting? For lunch, the easiest low carb vegetarian friendly options are usually a salad. Are things like beans, hummus, avocados, and carrots off the table throughout the day? Finally, at the end of a long day, is it better to stay low carb if it possible, even if you have been low carb throughout the day as well? Hi Paul! Great questions! When we look at things like “is having an apple in the AM going to diminish my fat loss results” we have to stay away from theory and look at YOUR reality. Does it represent an improvement for you? In theory and in practice, following the Golden Rules of Carbs & Fat Loss will be best for fat loss. But in reality, what you were eating before matters. I talk often about how when I was at my heaviest, I was eating biscuits and hashbrowns and fried chicken for breakfast. Having an apple would have been a MAJOR improvement (it would raise my blood sugar by less and for longer and therefore create a smaller insulin response) than my previous breakfast. On the other hand, if I were to add an apple now, it would not be an improvement for me and it would not create results because it would raise my blood sugar more and for longer (creating a larger insulin response) than what I eat now. So, consider whether or not it represents an improvement for you. Also look at: are you getting results with the way you’re eating. We don’t have to go for the ideal. The ideal is certainly to avoid the carbs in the AM (including fruit) and minimize beans/hummus at lunch. But that doesn’t mean that’s the step you have to take next. As for if it’s better to stay lower carb in the evening – your body will give you these answers via your energy and your fat loss results. I certainly prefer to avoid starch/fruit all day most days, but that’s just what works for my body. Thank you so much for taking the time to respond!!! I’m really happy that I came across your website because I feel like like having the freedom to eat carbs in the evening will help make things easier for me in terms of eating with my gf and family. Regarding breakfast, what do you recommend for people who exercise in the morning if we’re talking about best practices and the golden rule? Would you advise against protein shakes? If I had to eat something light before my workout to get some energy, what would you recommend? For lunch, what do you think about traditional “healthy” foods like almonds and avocados since they have some carbs. Do you personally like to snack on anything throughout the day or do you stick to three meals? Thanks again for taking the time to respond to these comments, it’s incredibly nice of you. Hi Paul, Please feel free to email me any time for answers to more in depth questions. Re: eating before a workout – this depends on what works for you. Re: foods with carbs. This is not a black/white thing. When I talk about the golden rules, I’m talking about true carbohydrates, not fats or proteins with trace amounts of carbs. I think as you listen to more podcast episodes, you’ll find lots more answers to these kinds of questions. Hi, I’m a little confused about this. I’ve seen multiple sources, saying to eat your carbs at night. Yet every single time I give that another try, I weigh more the next day. And my wife has the same experience. Last night, I made us a curry dinner. Chicken, tomato sauce, coconut milk, precooked frozen white rice, peas, corn and (of course) lots of spices (turmeric, ginger, black pepper, garlic, cayenne pepper, paprika, cumin). The entire pot totaled less than a thousand calories, so we each had just under 500. Weighed in this morning, I was a pound heavier, and she was up 4 ounces. Are we “doing it wrong”? Any information/suggestions would be appreciated. If our earlier in the day eating habits would help you answer, I do intermittent fasting (at least 16 hours a day), when I first ate yesterday (around 3), I had a smoothie (hemp protein, collagen protein, maca powder, raspberries, blackberries, spinach, and broccoli), took fish oil and a multi vitamin. I had a spoonful of (all natural, no-sugar-added) peanut butter, a few hours between my smoothie and dinner. She had a bunch of veggies and an egg for breakfast and a bowl of kidney bean and kale soup for lunch. We’ve been losing weight pretty steadily with our chosen eating plans. But every time we have a day where we keep it low-carb or free of non-fiber carbs until dinner, we wake up heavier the next day. So, are our systems so weird/messed up that this won’t work for us? Or are we doing something wrong? First, the scale isn’t a good indicator of what is happening with your body. Third, weight being up in the morning is reflective of the fact that each gram of carb holds onto about 4 grams of water. So this is likely water retention and has little to nothing to do with fat loss. Also, peanuts are a carb with some fat and protein. Fruit = carbs. Check out episode 195 and/or my course on carb strategies for fat loss. I could write a novel here and it’s tough to address all the issues in a comment but the golden rules of carbs and fat loss are super specific and work like a charm. Nothing you share here is a surprise. If you need more specific responses, never hesitate to email me. Can you please give me some ideas for no carb meals ?? And at night did you mix simple carbs with fat or not ?? Raghda – It’s not about “no carbs”, it’s about limiting STARCHY carbs during the day. Vegetables are carbs and most of those are totally fine at any meal. We’re just limiting starchy carbs, processed foods, sugar, etc. Definitely listen to episode 195, I think this will clear this up. I personally don’t eat “simple carbs” but really, progress comes down to what represents an improvement for YOU. Def take a listen to episode 195 of the Primal Potential podcast 🙂 I really think it will help a lot. So my big question for you is this. Is the ketogenic diet effective? I struggled with adrenal issues for the last several years so intense workouts on intensity interval training that kind of stuff aren’t really an option for me. I stumbled upon your article accidentally and was rereading it thinking that it was from a ketogenic site and now I’m confused. Hey I’ve done this for like 6 days but now there is an anoying feeling in my kidneys some sort of cramps It happens when I eat to much salty bad food and little amount of water but during these 6 days I didn’t do that at all could the reason be eating too much meat products I’m afraid from procuring in this because of this bad cramps any advice? 1.Are you just a human being giving advice? Are you a trainer or something? 2. Weight loss is different for everybody, you should point out that this method did work for you and some others, but most professionals believe the contrary to what you’re saying, so they probably aren’t wrong either. 3. I feel the better advice would be to not eat only starchy carbs as breakfast. For instance if someone is just having cereal or pancakes only for breakfast, of course they’ll be hungry. Recommend a whole wheat pancake with fruit on top and something high in protein, like eggs or turkey sausage. People can eat carbs but should cut down on the starchy ones and try to get most of their carbs from fruits and vegetables. 4. Yes, you can eat before bed, but if you’re really hungry and you have already had dinner, you are a adding an extra meal to your day. Different foods can also disrupt your sleep, and a good night’s sleep is important to weight loss. Thanks for your opinion on this but you should reiterate that this is just an opinion because it comes up as a result on Google when I typed in a question about weight loss. So you could be misleading people. Hi Melissa, thanks for your feedback! My primary ethos is: do what works for you and I repeat this on hundreds of podcast episodes and blogs. No, I am not a personal trainer, which is why you won’t hear me coach people on workouts. I do, however, have degrees in human nutrition and biochemistry. I have lost over 100 lbs and helped hundreds of others lose fat & get healthy. I completely respect your opinion and wish you all the very best. Cortisol doesnt rise at night but falls. There are so many errors in this article that i hope people will look at articles with sources to make better judgements. What might have confused you is that it also says “cortisol level rise through the night” and there I’m referring to the overnight period prior to their AM peak – so they are lowest in the evening around that “bedtime” hour but do gradually rise to help us wake in the AM. I also emailed you a voice note to help address any confusion there. I’m sure I have blogs with mistakes and also blogs where I could do better in explaining things clearly, but the error you’re pointing out isn’t here in this article. I am grateful for your feedback though so I can go back through and find ways to be more clear. I also have dozens of podcast episodes where I explain circadian rhythm and cortisol being at a low point in the evening and peaking in the morning. Finally someone breaks down the process in a very basic and easily understood way. Thank you & kudos. Will be going through all your articles. You’re so welcome, Jack! Let me know if there’s anything I can do to help! I am amazed at how much better I feel eating starchy carbs only in the evening. I plan to eat this way the rest of my life. I am surprised that when I search this way of eating on the internet, not a lot comes up. Your site did, so I plan to read up on it 🙂 thanks! Awesome Lindsay!! Stay in touch! Let me know if there’s anything I can do to help! Thank you. I have been eating Keto for a few months and don’t miss the carbs but I find that if I eat the majority of my carbs in the evening, I wake up feeling soooo much better and less dehydrated than usual. Any explaination for this? Hi Vienna – Carbs hang on to water – so if you’re eating more carbs, you’ll retain more water. Less dehydration. Hi Elizabeth. Been listening to your podcasts religiously lately. Ive been wondering about doing a carb spike before bed to enhance my morning fasted workouts. I’ve been doing Keto for almost two months. Very low carb, usually less than 30 a day. I do IF till 1PM and end my feeding window around 8PM. I work out fasted in the morning around 6:30 AM. If I had a banana with some almond butter around the end of my feeding window. Would that fuel tomorrow’s workout? Or mainly get stored as fat? Thanks! Whether or not it gets stored as fat depends on things like how much glycogen you have in you muscle tissue and liver. It also depends on your insulin sensitivity and your energy needs. There’s no way to answer this specific to you based on “theory”. But here’s the thing – this decision depends on your goals. If your goal is fat loss, I wouldn’t do this. You want your body bunrning fat, not sugar. If fat loss isn’t your goal, play with it and see if it meets your goals. I also don’t know what you mean by “spike” – that’s certainly relative. This is a great article and I’ve been following this way of eating since a long time. I’ve a few questions. I usually run in the mornings. The days I do about 4 or so miles I don’t need post workout carbs and usually stay fasting till about 12 noon. Few days when it’s about 10 km or so are the days when I don’t know whether I should eat some food. I usually have a spoon of homemade peanut butter. Any advice if you can give on this. I need to lose about 10 pounds as I’ve reached a plateau with my weight loss. I don’t really have enough information to give you any advice. I will instead ask a few questions for you to consider and use as a starting point: Are you eating only when you’re hungry? Where and when do you think you’re giving your body more fuel that you need? Are the longer runs working for you? What elements have you changed and do those changes produce results? I’m a big fan of NOT shooting in the dark and knowing very little about your diet, I just can’t give specifics. With that said, fat loss is driven primarily by nutrition, not movement. If your body isn’t responding to what you’re doing, it’s time for a change. I am doing the same too and it gives me enough carbs to feel satisfied at night when I eat dinner (Dinner is when I feel I need to eat the most). I have one question. Since I lift while trying to lose fat, I am trying to eat a certain level of protein (e.g. 100-120g per day). I skip breakfast in the morning (I do Intermittent Fasting 16:8) and I eat eggs, lentils and yogurt/kefir mixed with egg whites for lunch. I do lentils because though they have carbs, they are complex carbs with fiber and give me the protein. Is that OK? I keep my starchy carbs (e.g. rice, quinoa, etc) for the night. Am I going in the right direction? Good article I only eat between 2pm and 10pm(if) I work out fasted before then but if I eat carbs as my first meal I fall asleep doesn’t matter where I am I can’t help it so I have to keep carbs until night time. Is there a reason they make me so tired after fasting? Yup! Blood sugar fluctuations. If you listen to episode 195 of my podcast, you’ll hear my thoughts on making that first meal lower in starch and sugar. Hi, so I have been doing Intermittent fasting for 3 months now with great results (fasting everyday from 8 pm to 12 pm). Recently I started getting cystic acne and I missed a period, which is very uncharacteristic of my body. I do crossfit in the early morning before work, and so I was fasting until noon. From what I’ve been reading, I think my testosterone levels were getting too high which was messing with my hormones. I think its best I go back to a normal eating schedule and not fast regularly. With that said, I still want lose some more fat around my belly. With adding breakfast back in to my morning routine after my workout, is it ok to add carbs in with my protein and fat? Or should I try to just stick to protein and fat post-workout/morning? I don’t want to inhibit fat burning, but I also want to regulate my hormones. I’d start with just one change at a time so you know what drives the change. For example, if you start eating breakfast AND add in AM carbs at the same time, you won’t know which adjustment is impacting energy/body comp/hunger/performance, etc. to equal my caloric intake amount…mindboggling and I don’t want to inadvertently sabotage my efforts. I have found that info on the web is mighty confusing, how do I make it all work so that I lose weight more effectively and be well nourished? I have added more fats to my diet with olive oil, avacadoes ( which have been part if my diet since childhood) cook using a bit if lard and so-on. I also weight-lift and use HIIT for my cardio. I eat a cooked protein and veggies breakfast but 5 hours later I am ragingly hungry! Are two meals better than three with intermittent fasting and would sleeping 8 hours not be considered a fasting period anyway? veg, higher on the glycemic scale, so a no-no I believe, arrgh! So confusing!! I hate the calorie counting thing, in the past when I tried a diet plan like weight watchers, I was always thinking about my next meal, always feeling hungry so I am wary when I hear about the “New Diet Trend!”, Even though I am attempting at ketogenic style of eating, I want to drop weight and be lean again, but my head is spinning and not from hunger either. Last night I had some carbs in the evening, boy did I feel great! Toast with jam and a grilled faker cheeze (not soy) sandwich (yup, more than 5 % carbs it was) so yummy. I, as a rule limit wheat because I am just left conjested after eating it, last night I didnt care! And I have a dairy allergy, so truly eating keto has to be revised to accommodate my physiology…can you feel my hungry confusion? Hahaha. Maybe I’m letting myself be pulled into a trend instead of using what really works for me, as you wrote in your article. I hope my comment/question(s) aren’t all over the place here, my editing may need a brush-up.